132 MMS December 2016 mmsonline.com SYSTEMS AND SOFTWARE For more information about systems and software, go to mmsonline.com/erp and mmsonline.com/cam. 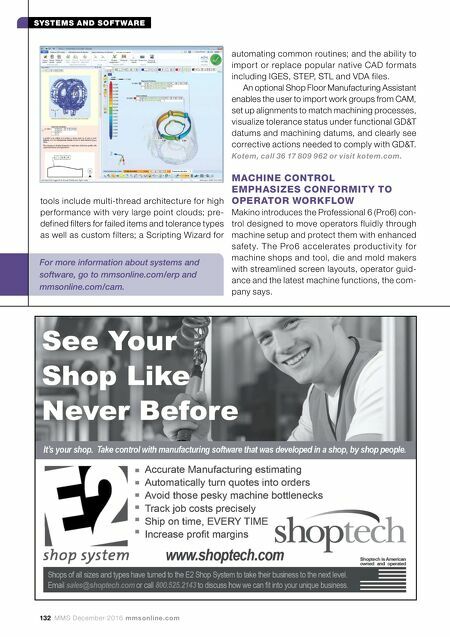 tools include multi-thread architecture for high performance with very large point clouds; pre- defined filters for failed items and tolerance types as well as custom filters; a Scripting Wizard for automating common routines; and the ability to impor t or replace popular native CAD formats including IGES, STEP, STL and VDA files. An optional Shop Floor Manufacturing Assistant enables the user to import work groups from CAM, set up alignments to match machining processes, visualize tolerance status under functional GD&T datums and machining datums, and clearly see corrective actions needed to comply with GD&T. Kotem, call 36 17 809 962 or visit kotem.com. MACHINE CONTROL EMPHASIZES CONFORMITY TO OPERATOR WORKFLOW Makino introduces the Professional 6 (Pro6) con- trol designed to move operators fluidly through machine setup and protect them with enhanced safet y. 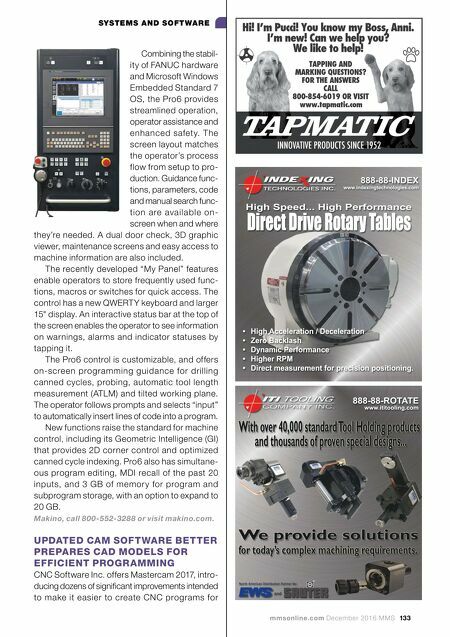 The Pro6 accelerates productivit y for machine shops and tool, die and mold makers with streamlined screen layouts, operator guid- ance and the latest machine functions, the com- pany says.